From greek yogurt, probiotic yogurt, whipped yogurt, and everything in between, navigating through all the selections seems a bit overwhelming. Look at the ingredients list: the first two ingredients should be: milk, then lactobacillus (example: L. acidophilus, L. casei, B. bifidum and B. Longum). When in doubt, go Greek. In comparison to regular yogurt, Greek yogurt are lower in sugar and have less lactose (so good option for our less lactose-tolerant friends). Avoid added sugar in your yogurt. Opt to add your own honey/fruits to the yogurt to avoid too much sugar. Doing a detox or a cleanse in the new year? One great substitution for sugar and/or caffeine is the energy-boosting goji berry. Native to China, this reddish orange berry has long been used in Chinese medicine and food for its powerful nutritional benefits. A randomized, placebo-controlled study showed drinking goji juice significantly improved energy level, mental acuity and your sleep cycle. Goji berries are sold in their dry form available at most health food stores. You can consume them either as is (like raisins), or brew them to make a tea. Since goji berries are naturally sweet, I don’t use any sweetener. Bring two cups of filtered water to a boil and pour the boiled water into a tea pot. Add a half cup of goji berries and let the tea steep for 15 minutes. To get all the goji juice into the tea, use a spoon to press on the goji berries. Strain as you would a regular tea. Option to add lemon slices to your tea if desired. Serve the tea hot or chilled! Amagase, H., & Nance, D. M. (2008). A Randomized, Double-Blind, Placebo-Controlled, Clinical Study of the General Effects of a Standardized Lycium barbarum (Goji) Juice, GoChi™ [Abstract]. The Journal of Alternative and Complementary Medicine, 14(4), 403-412. Potatoes are probably one of the most readily available produce out there. They are available all year long, and when prepared correctly, can be nutritious as well. They contain vitamin B6, potassium and vitamin C. Generally, nutrition and taste vary depending on the type of potatoes: from russet to red to purple potatoes, potatoes come in a lot of different varieties. While everyone have their own concept of the ideal potato salad, I like my potatoes to be a little on the firm side with skins intact (more nutritious). I prefer to use red potatoes, purple potatoes or fingerling potatoes, but feel free to sub the recipe with your favorite potatoes. Be sure to pick organic potatoes, to avoid GMOs. The best way is to steam whole potatoes, as it retains more of its water soluble vitamins (such as vitamin C) than boiling. But, you can also boil them as an alternative. To boil: cook whole potatoes with water in a pot in medium heat until the water boils. Reduce heat to low and simmer until potatoes are tender, about 10 minutes. If you are using frozen peas, make sure to boil or steam the peas first (~3 minutes). Add the cut potatoes along with celery and peas in a mixing bowl. Season with salt and mix. Add the rest of the ingredients and toss gently. Cover and refrigerate the potato salad for at least an hour. Serve chilled or at room temperature. First, want to thank Deborah of Urban Naturale for featuring us on her Plant-based postluck party! Our fall root-vegetable vegan black-bean burger was featured. I want to start this post with a caveat – I am a huge fan of the plant-based lifestyle and I have tried to go vegan many times, but I have not yet fully succeeded. My last attempt floundered when I was doing a 2-week night-shift around the holiday season. Trust me when I say ICU nurses and Emergency Department nurses ALWAYS have access to candy and dessert, ESPECIALLY around christmas time! And then there was the candy drawer in the family medicine office – let’s just say nurses will always make sure there is some candy around. Maybe it’s because of their motherly nature, or due to their stressful jobs, or because their patients are so grateful to them and bring them candy. Probably a combination. I love my nurses though – couldn’t have survived residency without them! Despite my unsuccessful vegan attempts at being vegan, my fridge and pantry is almost completely vegan, and I rely on certain products to make the majority of my diet pretty close to plant-based. Trader-joes has been a life-saver. My favorite story about trader joes is that the first voluntarily organic thing my husband ever bought was from Trader Joes! Pretty cool, huh? 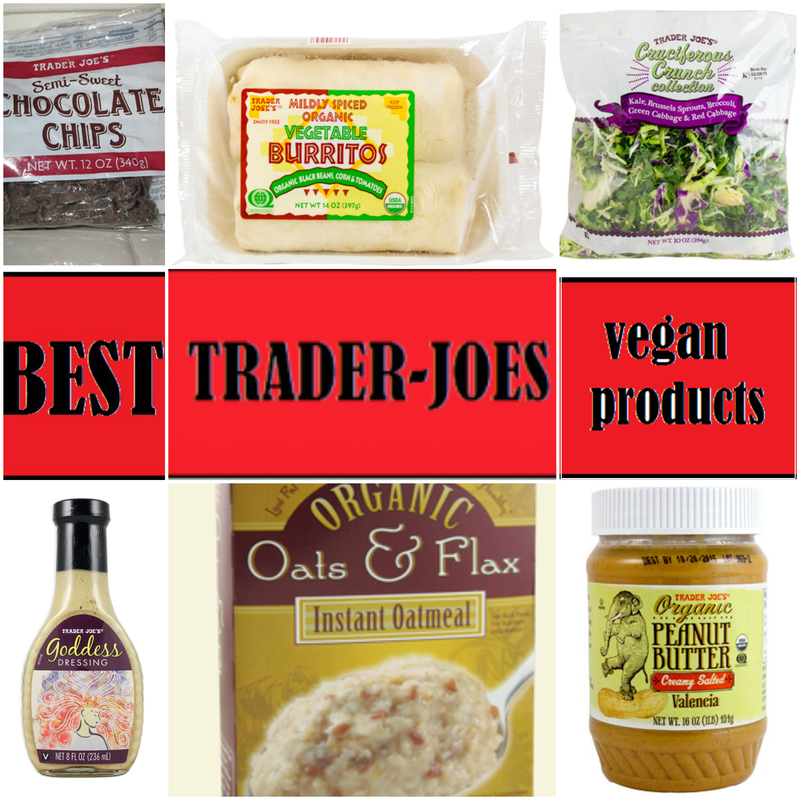 I got the idea for this post because I saw this one from A Dash of Soul about the best vegan items at TJs, and after I got myself some of that strawberry coconut dessert, I decided the world needed to know how Trader Joes helps me be practically vegan. Here goes! Mildly Spiced Organic Vegetable Burritos: These guys are awesome. You get two burritos for $3.29! Way cheaper than the other frozen burrito alternatives out there – Amys black bean vegetable burritos for example, are generally $3.00 for one burrito. And they are quite delicious. A lot of vegan burritos have a ton of rice, and this decreases the nutrient density of the burritos. These burritos are big on vegetable and bean content. I usually take off some of the tortilla to further improve on the nutrient density. Trader Joes Creamy Valencia Peanut Butter – This peanut butter is one of the best peanut butter finds ever! Valencia peanuts are super low in sugar and starch, and have 3g of fiber per 2 tbsp serving. Valencia peanuts are less likely to have aflatoxin, which is something found mostly in peanuts grown in humid climates. Although the government monitors how much aflatoxin is allowed in peanut butter, it’s always good to minimize the possible susceptibility to liver cancer. Valencia peanuts are also generally sweeter. This means they really don’t need any extra sugar to sweeten the peanut butter. Trader Joes Goddess Dressing: For those who love creamy dressings, this one comes as a salad-rescue. This dressing has a tahini base and is one of my favorites, next to just using lemon, salt, pepper and olive oil. The tahini flavor isn’t over-bearing either. Beware the fat content though! 18% of your daily recommended intake! Trader Joes Cruciferous Crunch Collection Salad Mix: The easiest salad you will ever make is using a small handful of this salad mix, and combining it with a bigger handful of any other salad green (eg. Arugula, Spring Mix, Mache) and adding a small handful of nuts. 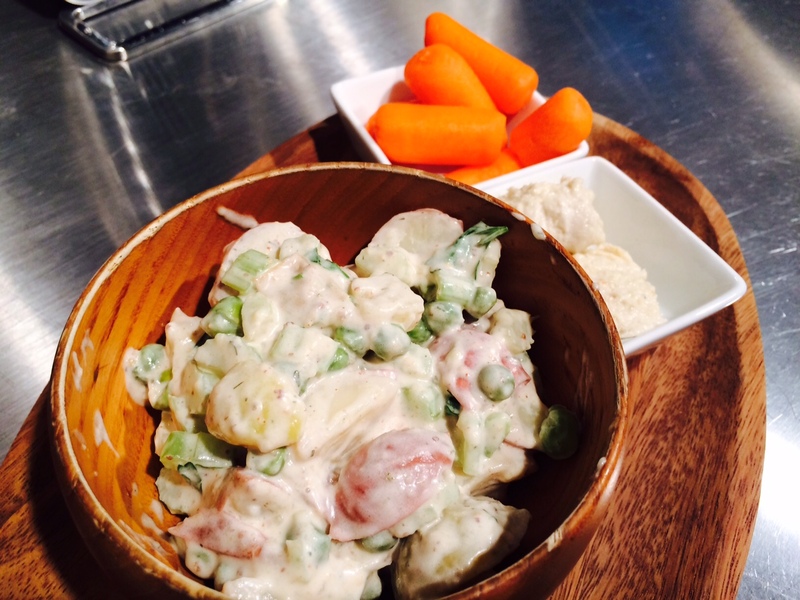 Toss with the above dressing, and voila! You have a salad that is crunchy and flavorful, and of course, packed with immune-boosting, cancer-fighting cruciferous vegetables. Trader Joes Organic Oats and Flax Seed Oatmeal: Flax seeds pack lots of nutrition. They are high in fiber and omega 3 fatty acids. Flax seeds and oats are both particularly high in soluble fiber, which is really good for decreasing your cholesterol (soluble fiber binds to bad cholesterol and fat). Soluble fiber also is particularly helpful for improving your gut flora as it has prebiotic properties (helps build a favorable environment for good bacteria to grow). Thats why this product is a staple in our house. Beware – it does have some sugar – 1 packet has 11g to be precise. That’s about 2.5 tsp. I’m willing to live with that. Trader Joes Dark Chocolate Chips – I know, they are a dime a dozen – most dark chocolate chips are vegan, too. However, a lot of dark chocolate chips are kind of hard and you might as well be biting into very sweet cacao nibs. The way these are formulated, they are super deliciously easy to bite into. Throw them in your oatmeal, eat them on a peanut butter sandwich with some toasted coconut, blend them in your smoothies – these are magnesium containing, anti-oxidant rich, pure decadent, deliciousness. 1 tablespoon of these contains 8g of sugar, so something to watch out for. Do you have any TJs favorites? Would love to hear yours! After last weeks post (Translation: after wasting hours of productivity looking at delicious vegan and vegetarian black-bean burger recipes), I realized that bean burgers are one of the most versatile recipes out there. An old Mark Bittman customizable soup recipe came into my mind, and I decided to impart to you all a customizable vegan bean-burger recipe. Since my inspiration for this post was the many bean burger recipes out there in cyberspace, at the bottom of this post, I’ll also post some links for other bean burger recipes that I found helpful. Beans – (any kind – 2 cans will suffice. Examples – black beans, chickpeas, white-beans). Dont throw away the liquid, and mash these up. You want to mash them up enough so that you have a batter, but not so much that its a puree. Binder: This is to hold your patty together. Personally, I love my black-bean patties a little crumbly. Lots of recipes use eggs – 1-2 will suffice, but we are going for vegan here. You can use a vegan egg replacer. Here’s a nice infographic with egg substitutions: I am not sure how well bananas, apple sauce and peanut butter would work out here though. If you were using a vegan substitute, just use the vegan equivalent of 2 eggs (eg) 2 tbsp of ground flax. Whats nice is that you actually dont have to let the flax seed sit in water before hand for this recipe because the flax will absorb the moisture from the batter. A grain or starch: Other than the potato/sweet-potato and brown rice, the starches also have a binding quality to them. Most recipes use a cup. Example are grains like quinoa, oats, brown rice, panko bread crumbs and even bread (one recipe suggested you put bread into a food processor and use the bread-crumbs from that). I have seen other recipes use sweet-potato or just potato, and chick-pea flour (besan) is another common one. You can also use corn starch or tapioca starch. You can use whole grains or you can grind them in a coffee grinder to make a flour. Oh yeah, you can use wheat or a gluten-free flour of your choice too. Spices: Go nuts! Use whatever you want! Most use cumin and garlic powder at a minimum. Use about 1tsp of salt or more to taste. If you arent using jalapenos, you might want to add crushed red pepper, sriracha, or chili powder. Paprika lends a smokey-ness. Soy-sauce lends a nice, savory umami flavor. Dipping sauce (optional): Adding a tbsp of Sriracha to some vegan mayo you have lying around is common. You can use some salad dressing. Another option is to make a tahini or nut-based based dipping sauce. Or you can use any condiment in the fridge. An avocado base or guacamole is another option. Mash up the beans with the bean juice from the can using a fork or masher. Add in your starch, spices, and binder. Add in your veggies. Use a wooden spoon or your washed hand to mix the batter so the ingredients are distributed evenly. To cook the burgers, coat a cast iron pan with your oil of choice (I like coconut for its high smoke point). Spoon the batter on to the pan and flatten with your spoon so it looks like a patty. Let it cook on low heat for 20 minutes on each side. The burger is ready to be flipped when it is holding together on the side which it is cooking on. The flip and cook to your desired crispiness. You can also bake these too but I havent tried to do that yet. I will update this post if I do. Add on your condiment and place between 2 pieces of scrumptious bread if desired. Serve with a side salad to make the meal complete. Lately, I have had an insatiable craving for vegan black-bean burgers. I have no idea why, but the crispy crunchy outside with the soft inside, combined with the savory flavors of the vegan mayo and/or sriracha on top..mmm… the symphony of flavors was begging for a replay. ..So I had one, and then another, and then I just started to look for recipes for vegan black-bean burgers online. It’s funny, I know how hunger works, and it is not satiated if you look at 20 pictures of just delectable looking vegan black-bean burgers on the internet. Of course, make delicious vegan black-bean burger patties is what I did. When my husband who has the most discerning palate of anyone I know said they were tasty, I knew I had to share with the world. Especially because bean-recipes are one of my favorites to share with the world. I was super excited about this recipe because I literally did zero shopping for it – everything I used was already in my pantry. One can of black beans, drained, and one can of chickpeas, with the juice. Mash up the beans and chickpeas. You should still be able to see half fragments of beans – so don’t mash up too much! Grind frozen root vegetables in a blender into a powder. Use the dry blades that make powders for this. You can also grate fresh beets/root veggies, or coarsely blend steamed (preferrably lightly steamed) or canned beets. Shredded or grated carrots are a good addition here as well. Spoon onto a cast iron skillet coated with oil and heat for 15 minutes on each side. The cooked patty is brown and has a crust on the top and bottom. Indians love their snacks, and I am no exception. When you go to India, your hosts make it their job to fill your day with deliciousness. First there is breakfast, then there is “coffee” which is between breakfast and lunch and includes more than coffee, then there is lunch, then there is “Tiffin” which comes between lunch and dinner and includes lots of bad for you snacks, and then finally there is dinner. So naturally, I love snacks and I often feel “snacky”. 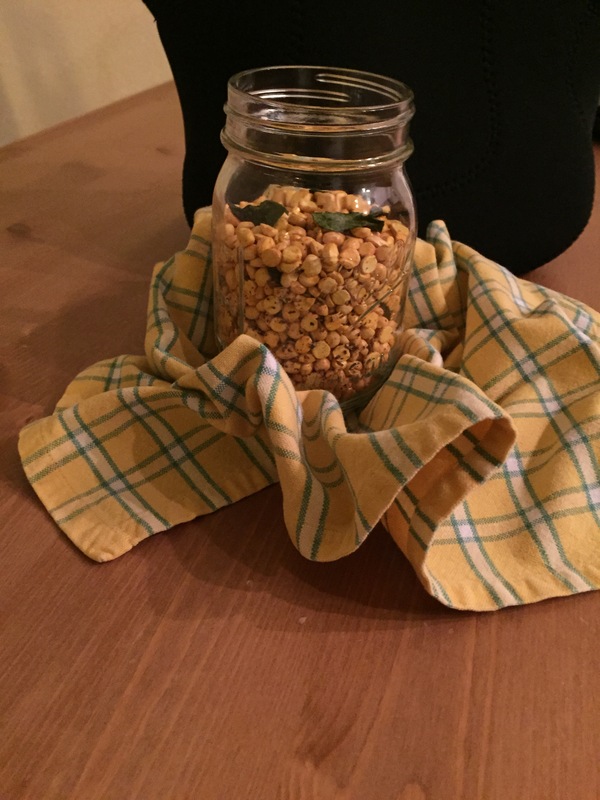 I have been seeing re cipes for roasted chickpeas all over pinterest. I really do enjoy them, but I realized that the Indian grandmas and home-makers of the world have made sure of one thing despite all kinds of cosmic shifts and changes in political winds – that prices at the Indian grocery store stay amazing. Given that both my parents have diabetes, I’ve been trying to stay away from refined carbohydrates. Now, I should say that the resistant starch found in beans breaks down with heat, and Dalia have been roasted. The fiber shell has also been taken off. However, take a look at the nutrition info on these babies here. Lots of protein, and lots of fiber. I thought they would be a pretty good base for a snacky dish :). Once you get how to make a Tadka – “spices tempered in hot oil” – Indian cooking is basically the same from dish to dish. Heres a great article on tempering of spices. For this tempering, I used cumin, black mustard seeds (optional), curry leaves (optional but when added really give the dish a nice flavor and fragrance), and dried red chillis. The cumin lends a lovely spicy fragrance, and the black mustard seeds lend a pungent taste. These spices are in addition to the chilli powder, turmeric, salt and garlic powder that you add. Once you have the ingredients, this dish takes just about 15 minutes to make. Here’s the finished product! Dont you just want to reach in with a spoon? nom nom. Thats my lunch-box in the background. In a separate small pan ( a small soup pot will do. For my tempering spices, I use this pan), heat a little oil. I use coconut as it has a high smoke point. Add the tempering spices except the curry leaves. When you hear the spices start to sputter, add the curry leaves. Be careful, as the oil can splash! The tempering is done when you see the dried red chillis start to turn almost black. Heres a video to help you out! My ingredients are different, because the Tadka (tempering) varies based on the dish. Pour the tadka into the Dalia which is toasting. The oil from the tadka will help the coat the chilli powder, oil, turmeric and other spices in the non-stick pan. An option is to cut raw onions and serve this mixed with raw onions, 1 green chilli pepper chopped, chopped coriander, and lemon. The dish is very dry and heating, so the cooler raw ingredients help with that in the hot weather. The finished product looks like this when you serve it that way.